Michael Hutchison in his office, July 2015. For over 30 years, UC Santa Cruz economics professor and alumnus Michael Hutchison (Merrill, ’76, economics) has studied financial crises and economic booms. He has analyzed why markets rise, fall and everything in between. 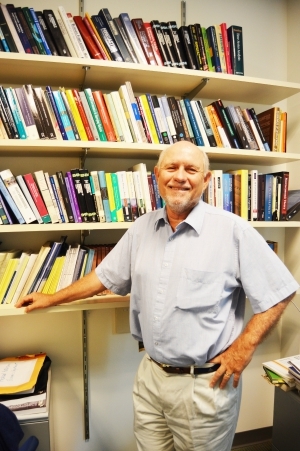 Since joining the UCSC Economics Department as a professor in 1985, Hutchison has tracked and analyzed the Japanese economic bubble of the late 1980s and its collapse in the 1990s. He has noted America’s plunge into the great recession in 2008 and drew parallels with Japan’s crisis a decade earlier. He watched the markets in India liberalize and deregulate and judged the impact on the economy and financial system. He saw the Eurozone crisis collapse economies in 2013. Each time, he examined the global fallout on markets worldwide, and at times, even anticipated the problems that materialized. Understanding how global economies are intuitively interconnected is what makes Hutchison a leading expert in international finance. His work guides policy makers and academics, government officials and investors. He is considered to be in the top 5% of all economists worldwide and ranks in the top 50 economists in international finance, according to Research Papers in Economics (RePEc), the largest bibliographic database dedicated to economics on the web. As a macroeconomist, Hutchison makes big picture connections that are universal reminders. For example, his work about Japan’s infamous 1990 economic collapse serves as a cautionary tale that economies can fall abruptly without warning, as recently demonstrated with the unpredicted recession of 2008. “There is no doubt that Michael Hutchison’s work on financial crises continues to be an important source of guidance for policy makers in the United States,” says Robert Fairlie, Department Chair of UCSC’s Economics Department. For example, in the 1999 book Fiscal Aspects of European Monetary Integration, Hutchison and his coauthors anticipated many of the problems and predicaments Europe now faces with the Euro. Michael Hutchison is a Professor in the Economics Department at UC Santa Cruz. He is also Research Associate at the Center for Pacific Basin Monetary and Economic Studies at the Federal Reserve Bank of San Francisco, and Senior Research Associate of the Economic Policy Research Unit (EPRU) at the University of Copenhagen. Hutchison is Executive Editor of the Journal of Asian Economies and on the editorial board of Japan and the World Economy and Journal of International Money and Finance. Hutchison’s theoretical argument at the turn of the new millennium has transformed into real problems. Because of the authority Fiscal Aspects of European Monetary Integration carries, it has recently been republished as a seminal text used by academics and economists worldwide. For example, in his research on emerging markets, Hutchison explores how US fiscal problems can impact seemingly insular economies in other countries. Hutchison shows that no move in a market can go unnoticed. One decision on Wall Street can be felt thousands of miles away. There is an international consequence for every evaporated credit trade, a fall out for each decrease in international transaction, and a repercussion for every commodity price downturn. If there is a financial aftershock to be felt, Hutchison will find it. “If the question is important,” Fairlie says, “Hutchison has been willing to do the the hard work to find and translate that evidence to a form necessary to test hypotheses,” noting that he asks what market reactions are a warning sign for another economic downturn, or which financial movement can be a lesson for fiscal growth. Currently, Hutchison is working with institutions in Switzerland and Holland where he is researching monetary policy, specifically how countries control the money supply, inflation, and interest rates.